Andr? Previn was born to a Jewish family in Berlin, Germany. His brother was the director Steve Previn (1925-1993). With his family, he emigrated to the United States in 1939 to escape the Nazi Regime in Germany. He became a naturalized citizen of the United States in 1943, and grew up in Los Angeles. At his Summer 1946 graduation from Beverly Hills High School Previn played a musical duet with Richard M. Sherman: Previn played the piano, accompanying Sherman (who played flute). Coincidentally, twenty one years later, both composers won Oscars for different films, both winning in musical categories. In 1967, Previn became music director of the Houston Symphony Orchestra. In 1968, Previn began his tenure as principal conductor of the London Symphony Orchestra (LSO), serving in that post until 1979. During his LSO tenure, he and the LSO appeared on television in the programme Andr? Previn's Music Night. From 1976-1984, Previn was music director of the Pittsburgh Symphony Orchestra (PSO), and in turn had another television series with the PSO titled Previn and the Pittsburgh. He was also principal conductor of the Royal Philharmonic Orchestra. In 1984, he was named music director of the Los Angeles Philharmonic, officially taking over the position in 1985. While Previn's tenure with the orchestra was musically satisfactory, other conductors including Kurt Sanderling, Simon Rattle, and Esa-Pekka Salonen, did a better job at the box office. Previn clashed frequently with Ernest Fleischmann (the orchestra's Executive VP and General Manager), most notably when Fleischmann had failed to consult him before deciding to name Salonen as Principal Guest Conductor of the orchestra, complete with a tour of Japan. 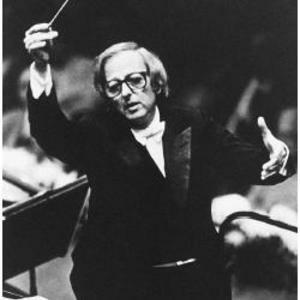 Because of Previn's objections, Salonen's title and Japanese tour were withdrawn; however, shortly thereafter in April 1989, Previn resigned as Music Director. Four months later, Salonen was named Music Director Designate of the Los Angeles Philharmonic, officially taking the post of Music Director in October 1992. Previn's many recordings include the three complete ballets of Tchaikovsky, Swan Lake, The Sleeping Beauty, and The Nutcracker, and the complete symphonies of Ralph Vaughan Williams, all with the LSO. With the Los Angeles Philharmonic, he made other recordings of music by Sergei Prokofiev (most notably, the Symphonies 1 and 5, the score to Alexander Nevsky, and the Symphony-Concerto for Cello & Orchestra with Heinrich Schiff as soloist), symphonies and other pieces by Anton?n Dvo? ?k, and works by contemporary composers including William Kraft, John Harbison, and Harold Shapero. Previn has composed film scores and other musical works including a cello concerto and a guitar concerto. He has also adapted and conducted the music for several films?some of them stage-to-film adaptations, such as My Fair Lady, Kismet, Porgy and Bess, and Paint Your Wagon, but several were written especially for film, including the Academy Award-winning Gigi. Several of the film scores were collaborations with his second wife, Dory Previn. In the mid-to-late 1950s, and more recently, he toured and recorded as a jazz pianist. In the 1950s, mainly recording for Contemporary Records, he worked with Shelly Manne, Leroy Vinnegar, Benny Carter, and others. An album he recorded with Manne and Vinnegar of songs from My Fair Lady was a best-seller (see My Fair Lady (album)). Andre Previn made two albums with Dinah Shore as arranger, conductor, and accompanist in 1960 and made several appearances on The Dinah Shore Chevy Show in the early 1960s. He collaborated with Julie Andrews on a collection of Christmas carols in 1966, focusing on rarely heard carols. This popular album has been reissued many times over the years, and is now available on CD. In later years, he has concentrated on composing classical music. He collaborated with Tom Stoppard on Every Good Boy Deserves Favour, a play with substantial musical content, which was first performed in London in 1977 with Previn conducting the LSO. His first opera, A Streetcar Named Desire, premiered at the San Francisco Opera in 1998. His numerous other classical works include vocal, chamber, and orchestral music. Occasionally he has made recordings of jazz music on the Telarc label. In the United Kingdom, where he was knighted in 1996, Previn first became well-known as a result of his television appearances with the LSO. He is now particularly remembered for his performance as "Mr Andrew Preview" (or "Privet") on the Morecambe and Wise comedy show in 1971, which involved his conducting a spoof performance of Edvard Grieg's Piano Concerto, with Eric Morecambe as soloist. Because of other commitments, the only time available for Previn to learn his part was during a transatlantic flight, but the talent he showed for comedy won high praise from his co-performers. At a concert in Britain afterwards, Previn had to stop the playing of the concerto to allow the audience time to stop giggling as they remembered the sketch. It is still voted one of the funniest comedy moments of all time.